While they hail from all walks of life and denominations, there’s one thing that each of these ten preachers have in common: the name “Ken.” Despite any differences in legacy or spiritual opinion they may have, they are all connected by their first name. 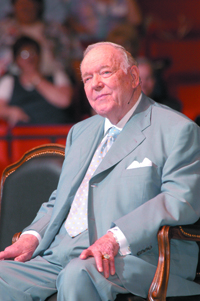 Kenneth Hagin – Reverend Kenneth E. Hagin was reportedly “miraculously healed” of a longtime childhood ailment by the power of God. Hagin also began what is now known as Rhema Bible Training College. He has been referred to as the “Father of the modern faith movement.” His son, Kenneth W. Hagin has taken over the ministry and it continues to flourish today, you can find out more by visiting their website. Ken Klaus – Klaus is known for being the Lutheran Hour Speaker, as well as being a minister for the Lutheran Church-Missouri Synod (LCMS), Klaus also has published several booklets. He has a master’s degree in theology and a B.A. in pre-seminary studies. The goal of the Lutheran Hour is to host programs that are significant worldwide and to speak the gospel to those who are unfamiliar with its teachings. The program then creates relationships with those interested in becoming more involved and in learning more about the Lutheran faith. Kenneth W. Wright – Wright is a minister at the New Iberia Church of Christ. He attended the University of Houston, the Houston Preachers Educational School and the Preston Road School of Preaching. On top of that schooling, he has received his Master of Theology. He helped establish the Southeastern Georgia School of Biblical Studies. Kenneth Copeland – Copeland started his own ministry and named it after himself: Kenneth Copeland Ministries. He and his family embrace the Word of God and form their lives around it. He became a born-again Christian soon after meeting his wife, and has been preaching ever since. Ken Hutcherson – Ken Hutcherson is the senior pastor and co-founder of Antioch Bible Church. Hutcherson became a Christian when he was in high school. He realized during college that several church groups did not focus as much on the scriptures as they did on who belonged to their sect and on the traditions of their particular church. He wanted to find a church that embraced every person, and promotes diversity among his congregation. Ken Kelly – Pastor Ken Kelly has his own blog, though he has been on hiatus from the blog since 2009. He has been the senior pastor of Chapin Baptist Church in South Carolina since 1986. He’s also on Twitter under the user name @pastorkenkelly. Ken Endean – Pastor Ken Endean is a minister at Cornerstone Baptist Church in Maine. His father was also a pastor. He received a BA in Bible and an MA in pastoral studies. He followed his faith from a young age, when his mother taught him about the grace of God. He is now married with three children and is an active pastor. Ken Smith – This pastor also had a preacher for a father. He was deeply devoted to his church, but eventually left for a short time. When he became seriously ill, he promised God to follow Him if only he were to be well again. He kept his promise and began to regularly attend church. Now, as a pastor, he is doing God’s bidding by following his life calling. You can find out more on his website. Kenneth Miller – While many pastors are known for their sermons, Kenneth Miller is known for his aid in a kidnapping case that took place in 2009. In the fall of 2012, he was convicted of helping arrange a flight to Nicaragua for Lisa A. Miller and her daughter (no relation to the pastor). The courts had ordered, in 2009, that custody be shared between Lisa Miller and her ex-lesbian partner Janet Jenkins. These famous Christian leaders do share more than a name, even if their doctrinal differences seem to keep them divided from one another. Regardless of the sect their churches belong to, they all strive to be champions of the Christian faith. As a the son of a preacher I certainly have a ton of additional respect for the role and importance they play in the lives of their congregation and the church at large.